The pipe organ is a musical instrument that produces sound by driving pressurized air (called wind) through organ pipes selected via a keyboard. Because each pipe produces a single pitch, the pipes are provided in sets called ranks, each of which has a common timbre and volume throughout the keyboard compass. Most organs have multiple ranks of pipes of differing timbre, pitch, and volume that the player can employ singly or in combination through the use of controls called stops. 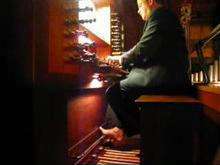 A pipe organ has one or more keyboards played by the hands (called manuals), and a pedalboard played by the feet; each keyboard has its own group of stops. The keyboard(s), pedalboard, and stops are housed in the organ's console. The organ's continuous supply of wind allows it to sustain notes for as long as the corresponding keys are depressed, unlike the piano and harpsichord whose sound begins to dissipate immediately after it is played. 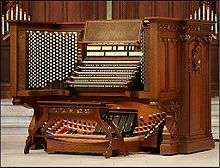 The smallest portable pipe organs may have only one or two dozen pipes and one manual; the largest may have over 20,000 pipes and seven manuals. A list of some of the most notable and largest pipe organs in the world can be viewed at List of pipe organs. The origins of the pipe organ can be traced back to the water organ in Ancient Greece, in the 3rd century BC, in which the wind supply was created with water pressure. By the 6th or 7th century AD, bellows were used to supply organs with wind. 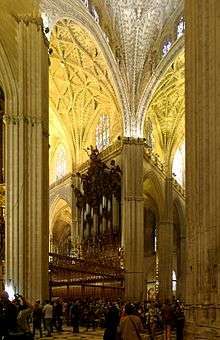 Beginning in the 12th century, the organ began to evolve into a complex instrument capable of producing different timbres. 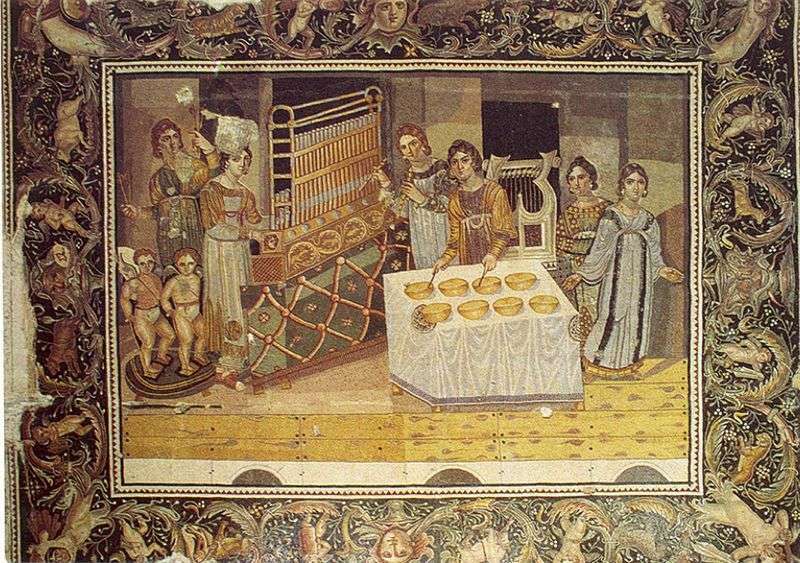 A pipe organ with "great leaden pipes" was sent to the West by the Byzantine emperor Constantine V as a gift to Pepin the Short, King of the Franks, in 757. 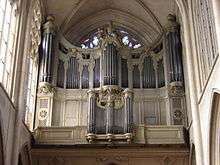 Pepin's son Charlemagne requested a similar organ for his chapel in Aachen in 812, beginning the pipe organ's establishment in Western church music. By the 17th century, most of the sounds available on the modern classical organ had been developed. 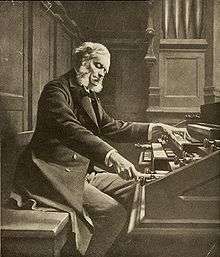 From that time, the pipe organ was the most complex man-made device - a distinction it retained until it was displaced by the telephone exchange in the late 19th century. 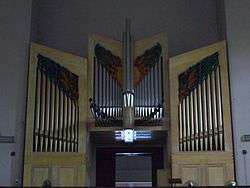 Pipe organs are installed in churches, synagogues, concert halls, schools, and other public buildings. They are used in the performance of classical music, sacred music, secular music, and popular music. In the early 20th century, pipe organs were installed in theaters to accompany the screening of films during the silent movie era; in municipal auditoria, where orchestral transcriptions were popular; and in the homes of the wealthy. The beginning of the 21st century has seen a resurgence in installations in concert halls. The organ boasts a substantial repertoire, which spans over 500 years. Carol Williams (organist) performs "Flight of the Bumblebee" by Nikolai Rimsky-Korsakov at the United States Military Academy West Point Cadet Chapel. The Greek engineer Ctesibius of Alexandria is credited with inventing the organ in the 3rd century BC. He devised an instrument called the hydraulis, which delivered a wind supply maintained through water pressure to a set of pipes. The hydraulis was played in the arenas of the Roman Empire. The pumps and water regulators of the hydraulis were replaced by an inflated leather bag in the 2nd century AD, and true bellows began to appear in the Eastern Roman Empire in the 6th or 7th century AD. The 9th century Persian geographer Ibn Khurradadhbih (d. 911), in his lexicographical discussion of instruments, cited the urghun (organ) as one of the typical instruments of the Eastern Roman (Byzantine) Empire. It was often used in the Hippodrome in the imperial capital of Constantinople. 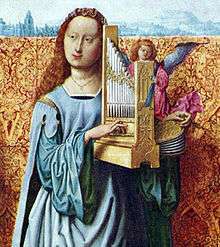 The first Western pipe organ with "great leaden pipes" was sent from Constantinople to the West by the Byzantine emperor Constantine V as a gift to Pepin the Short King of the Franks in 757. 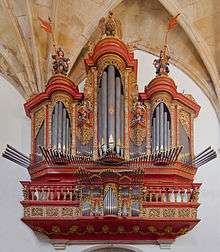 Pepin's son Charlemagne requested a similar organ for his chapel in Aachen in 812, beginning its establishment in Western church music. Different national styles of organ building began to develop, often due to changing political climates. In the Netherlands, the organ became a large instrument with several divisions, doubled ranks, and mounted cornets. The organs of northern Germany also had more divisions, and independent pedal divisions became increasingly common. The divisions of the organ became visibly discernible from the case design. 20th-century musicologists labelled this the Werkprinzip. During the Romantic period, the organ became more symphonic, capable of creating a gradual crescendo. New technologies and the work of organ builders such as Eberhard Friedrich Walcker, Aristide Cavaillé-Coll, and Henry Willis made it possible to build larger organs with more stops, more variation in sound and timbre, and more divisions. 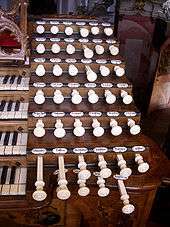 Enclosed divisions became common, and registration aids were developed to make it easier for the organist to manage the great number of stops. The desire for louder, grander organs required that the stops be voiced on a higher wind pressure than before. As a result, a greater force was required to overcome the wind pressure and depress the keys. To solve this problem, Cavaillé-Coll configured the English "Barker lever" to assist in operating the key action. In the mid-20th century, organ builders began to build historically inspired instruments modelled on Baroque organs. They returned to building mechanical key actions, voicing with lower wind pressures and thinner pipe scales, and designing specifications with more mixture stops. This became known as the Organ reform movement. In the late 20th century, organ builders began to incorporate digital components into their key, stop, and combination actions. 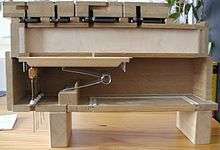 Besides making these mechanisms simpler and more reliable, this also makes it possible to record and play back an organist’s performance via the MIDI protocol. In addition, some organ builders have incorporated digital stops into their pipe organs. The electronic organ developed throughout the 20th century. Some pipe organs were replaced by digital organs because of their lower purchase price, smaller physical size, and minimal maintenance requirements. 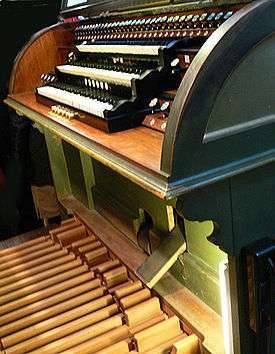 In the early 1970s, Rodgers Instruments pioneered the hybrid organ, an electronic instrument that incorporates real pipes; other builders such as Allen Organs and Johannus Orgelbouw have since built hybrid organs. It should be noted that electronic "organs" may have a lower purchase price but have demonstrated a higher cost of ownership as components fail and parts become obsolete. Pipe organs, made of metal, wood, leather, and felt can be maintained for centuries. Organ pipes are made from either wood or metal  and produce sound ("speak") when air under pressure ("wind") is directed through them. As one pipe produces a single pitch, multiple pipes are necessary to accommodate the musical scale. The greater the length of the pipe, the lower its resulting pitch will be. The timbre and volume of the sound produced by a pipe depends on the volume of air delivered to the pipe and the manner in which it is constructed and voiced, the latter adjusted by the builder to produce the desired tone and volume. Hence a pipe's volume cannot be readily changed while playing. Pipes are arranged by timbre and pitch into ranks. 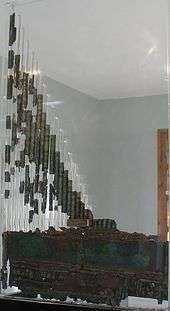 A rank is a row of pipes mounted vertically onto a windchest. The stop mechanism admits air to each rank. For a given pipe to sound, the stop governing the pipe's rank must be engaged, and the key corresponding to its pitch must be depressed. Ranks of pipes are organized into groups called divisions. Each division generally is played from its own keyboard and conceptually comprises an individual instrument within the organ. In a mechanical stop action, each stop control operates a valve for a whole rank of pipes. When the organist selects a stop, the valve allows wind to reach the selected rank. This control was at first a draw stop knob, which the organist selects by pulling (or drawing) toward himself/herself. This is the origin of the idiom "to pull out all the stops". More modern stop selectors, used for electric actions, are tilting tablets or rocker tabs. Tracker action has been used from antiquity to modern times. Despite the extra effort needed in playing, many organists prefer tracker action because of a feel and a control of the pipe valve operation. Before the pallet opens, wind pressure augments tension of the pallet spring, but once the pallet opens, only the spring tension is felt at the key. This provides a "breakaway" feel. A later development was the tubular-pneumatic action, which uses changes of pressure within lead tubing to operate pneumatic valves throughout the instrument. This allowed a lighter touch, and more flexibility in the location of the console, within a 50-foot (15-m) limit. This type of construction was used in the late 19th century to early 20th century, and has had only rare application since the 1920s. The most modern actions are primarily electronic, which connect the console and windchests via narrow data cables instead of the larger multiconductor cables of electric actions. Boxes containing small embedded computers in the console and near the windchests translate console commands into fast serial data for the cable, and back into electrical commands at the windchest[s]. The wind system consists of the parts that produce, store, and deliver wind to the pipes. Pipe organ wind pressures are on the order of 0.10 psi (0.69 kPa). Organ builders often measure organ wind using a U-tube manometer containing water, so commonly give its magnitude as the difference in water levels in the two legs of the manometer, rather than in units of pressure. The difference in water level is proportional to the difference in pressure between the wind being measured and the atmosphere. The 0.10 psi above would register as 2.75 inches of water (70 mmAq). An Italian organ from the Renaissance period may be on only 2.2 inches (56 mm), while (in the extreme) solo stops in some large 20th-century organs may require up to 50 inches (1,300 mm). In isolated, extreme cases, some stops have been voiced on 100 inches (2,500 mm). Playing the organ before electricity required at least one person to operate the bellows. When signaled by the organist, a calcant would operate a set of bellows, supplying the organ with air. Because calcants were expensive, organists would usually practise on other instruments such as the clavichord or harpsichord. By the mid-19th-century bellows were also being operated by water engines, steam engines or gasoline engines. Starting in the 1860s bellows were gradually replaced by wind turbines which were later directly connected to electrical motors. This made it possible for organists to practice regularly on the organ. Most organs, both new and historic, have electric blowers, although others can still be operated manually. The wind supplied is stored in one or more regulators to maintain a constant pressure in the windchests until the action allows it to flow into the pipes. Regulation adjusts the action so that all pipes sound correctly. If the regulation is wrongly set, the keys may be at different heights, some pipes may sound when the keys are not pressed, or pipes may not sound when a key is pressed. Tracker action, for example in the organ of Cradley Heath Baptist Church, includes adjustment nuts on the wire ends of the wooden trackers, which have the effect of changing the effective length of each tracker. ↑ Organ built by François-Henri Clicquot, 1771 and Joseph Merklin, 1864. Poliquin, Robert (1997). Organs in France: Église Saint-Germain-l'Auxerrois, Paris. Retrieved on 2008-03-03. ↑ Willey, David (2001). "The World's Largest Organs". Retrieved on 2008-03-03. 1 2 3 Randel "Organ", 583. ↑ Douglas Bush and Richard Kassel eds., "The Organ, an Encyclopedia." Routledge. 2006. p. 327. ↑ Michael Woods, "Strange ills afflict pipe organs of Europe". Post-Gazette, April 26, 2005. Archived February 22, 2012, at the Wayback Machine. ↑ N. Pippenger, "Complexity Theory", Scientific American, 239:90-100 (1978). 1 2 Smith, Rollin (1998). The Aeolian pipe organ and its music. Richmond VA USA: The Organ Historical Society. ISBN 0-913499-16-1. ↑ Thomas, Steve, 2003. Pipe organs 101: an introduction to pipe organ basics. Retrieved on 2007-05-06. ↑ "The Museums of Macedonia:Archaeological Museum of Dion". Macedonian Heritage. Retrieved August 28, 2009. ↑ Harper, Douglas (2001). Organ. Online Etymology Dictionary. Retrieved on 2008-02-10. ↑ Liddell, Henry George & Scott, Robert (1940). Organon. A Greek-English Lexicon. Oxford: Clarendon Press. ISBN 0-19-864226-1. Perseus. Retrieved on 2008-02-09. 1 2 Randel "Hydraulis", 385. ↑ Painting by Meister des Bartholomäus-Altars, 1501. ↑ Riaño, J. F. (1887). Critical and Bibliographical Notes on Early Spanish Music (PDF). London: Quaritch, 119–127. ISBN 0-306-70193-6. 1 2 Kennedy, Michael (Ed.) (2002). "Organ". In The Oxford Dictionary of Music, p. 644. Oxford: Oxford University Press. ↑ Sumner "The Organ", 39. ↑ Keyboard instrument (2008). In Encyclopædia Britannica Online (subscription required, though relevant reference is viewable in concise article). Retrieved on 2008-01-26. ↑ Phelps, Lawrence (1973). "A brief look at the French Classical organ, its origins and German counterpart". Steve Thomas. Retrieved on 2007-05-07. ↑ Organ by Hermean Raphaelis, 1554. Copenhagen Portal: Roskilde Cathedral. GBM MARKETING ApS. Retrieved on 2008-05-13. 1 2 Randel "Organ", 585. ↑ Bicknell "The organ case", 66–71. ↑ (French) Bédos de Celles, Dom François (1766). Extraits de l'Art du facteur d'orgues. Ferguson (Tr.) (1977). Retrieved on 2007-05-07. 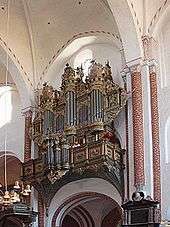 1 2 3 Randel "Organ", 586–587. ↑ "The decline of mixtures," in George Laing Miller (1913), The Recent Revolution in Organ Building. Retrieved on 2009-07-07. ↑ Bicknell "Organ building today", 82ff. 1 2 Randel "Organ", 579. ↑ Bicknell "Organ construction", 27. 1 2 Bicknell "Organ construction", 20. ↑ William H. Barnes "The Contemporary American Organ"
↑ Bicknell "Organ construction", 22–23. ↑ "Answers.com: Pull out all the stops". Draw knobs were the only type of stop control in past centuries, and are still used.American Heritage Dictionary of Idioms. Houghton Mifflin Company (1992). Retrieved on 2007-05-06. 1 2 William H. Barnes, "The Contemporary American Organ"
↑ Bicknell "Organ construction", 23–24. ↑ Douglas M. Considine, ed. (1974). Process Instruments and Controls Handbook (Second ed.). McGraw-Hill. pp. 3–4. ISBN 0-07-012428-0. ↑ The Boardwalk Hall Auditorium Organ in Atlantic City has four stops on 100 inches and ten stops on 50. Atlantic City Convention Hall Organ. Oddmusic.com. Retrieved on 2007-07-04. ↑ Bicknell "Organ construction", 18. ↑ Koopman, Ton (1991). "Dietrich Buxtehude's organ works: A practical help". The Musical Times 123 (1777) (subscription required, though relevant reference is viewable in preview). Retrieved on 2007-05-22. ↑ "Water Engines: Page 6". Douglas-self.com. 2011-06-10. Retrieved 2011-10-22. ↑ "St Jude's: History Pipe Organ". Bowralanglican.org.au. Retrieved 2011-10-22. ↑ "Antwerpse Kathedraalconcerten vzw". Akc-orgel.be. Retrieved 2011-10-22. ↑ "organ blowers 3". Nzorgan.com. 1997-07-26. Retrieved 2011-10-22. ↑ About Opus 72. C. B. Fisk, Inc.. Retrieved on 2008-05-13. ↑ Bicknell "Organ construction", 18–20. 1 2 Bicknell "Organ construction", 26–27. ↑ Bicknell "Organ construction", 27–28. ↑ Johnson, David N. (1973). Instruction Book for Beginning Organists. Revised edition. Augsburg Fortress. p. 9. ISBN 978-0-8066-0423-7. Google Book search. Retrieved on 2008-08-15. 1 2 This article uses the Helmholtz pitch notation to indicate specific pitches. ↑ The purpose of extended ranks and of their being borrowed is to save on the number of pipes. For example, without unification, three stops may use 183 pipes. With unification three stops may borrow one extended rank of 85 pipes. That's 98 fewer pipes used for those three stops. ↑ Organ built by M. P. Moller, 1940. USNA Music Department. United States Naval Academy. Retrieved on 2008-03-04. ↑ Pipe Organ Guide. American Guild of Organists. Retrieved on 2008-08-13. Archived January 1, 1970, at the Wayback Machine. ↑ Pipe Organ Guide. American Guild of Organists. Retrieved on 2007-06-25. Archived January 1, 1970, at the Wayback Machine. 1 2 3 "A brief tour of a pipe organ". Crumhorn Labs. Archived from the original on April 10, 2008. Retrieved 2008-04-19. 1 2 Wicks "Swell division", "Swell shades". ↑ Electronic setter. The Cinema Organ Society. Retrieved on 2009-07-07. ↑ PETER WILLIAMS, BARBARA OWEN, New Grove Dictionary of Music and Musicians, ORGAN STOP: Montre (Fr.). The case pipes of the French organ, corresponding to the English Open Diapason, the German Prestant, the Italian Principale, etc. Early alternative names were ‘le principal de devant’, ‘devanture en monstre’ (Reims Cathedral, 1570). The tone of the classical French Montre was somewhat more fluty than the various English Open Diapason types or German Principals. ↑ G.A. AUDSLEY Art of Organ-Building, Vol. I, p.544 ISBN 0-486-21314-5: MONTRE, Fr. -The name commonly applied by the French organ builders to such foundations and organ-toned metal stops as may be mounted or displayed in the buffet or case of an organ; accordingly, the MONTRES, which are usually of burnished tin, may be of 32 ft., 16 ft., and 8 ft. speaking lengths, as in the Organ in the Royal Church at Saint Denis near Paris. Sometimes the name is applied to the PRESTANT 4 ft., when its pipes are mounted. All the MONTRES are most carefully fashioned and finished, producing, when of tin brightly burnished, a beautiful effect in combination with the dark wood-work of the case. ↑ Bicknell "The organ case", 66–67. ↑ Caldwell, John (2007). "Sources of keyboard music to 1660, §2: Individual sources". In L. Macy (Ed. ), Grove Music Online (subscription required). Retrieved on 2008-05-07. 1 2 Caldwell, John (2007). "Keyboard music, §I: Keyboard music to c1750". In L. Macy (Ed. ), Grove Music Online (subscription required). Retrieved on 2008-05-08. ↑ McLean, Hugh J. (2007). "Böhm, Georg". In L. Macy (Ed. ), Grove Music Online (subscription required). Retrieved on 2008-05-08. ↑ Ledbetter, David (2007). "Prelude". In L. Macy (Ed. ), Grove Music Online (subscription required). Retrieved on 2008-05-08. ↑ Yearsley, David (1999). 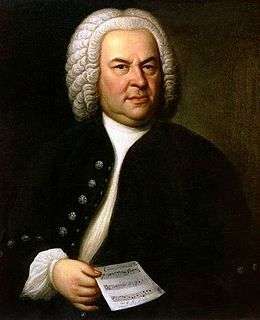 "The organ music of J. S. Bach". In Nicholas Thistlethwaite & Geoffrey Webber (Eds. ), The Cambridge Companion to the Organ, p. 236. Cambridge: Cambridge University Press. ↑ Lang, Paul Henry (1971). "Michael Haydn: Duo Concertante for viola and organ. Joseph Haydn: Organ Concerto in C major". The Musical Quarterly 57 (1). Retrieved on 2007-07-10. ↑ Portrait by Jeanne Rongier, 1888. 1 2 3 4 5 6 7 Owen, Barbara (2007). "Keyboard music, §II: Organ music from c1750". In L. Macy (Ed. ), Grove Music Online (subscription required). Retrieved on 2008-05-08. ↑ Brooks, Gerard (1999). "French and Belgian organ music after 1800". In Nicholas Thistlethwaite & Geoffrey Webber (Eds. ), The Cambridge Companion to the Organ, pp. 274–275. Cambridge: Cambridge University Press. ↑ Barone, Michael (2004). "Pipe organs are popping up in concert halls nationwide. Now—what to play on them?". Symphony magazine, Nov–Dec 2004. Retrieved on 2007-05-07. ↑ Lozenz, James Edward (2006). "Organ Transcriptions and the Late Romantic Period". In An Organ Transcription of the Messe in C, op. 169 by Josef Gabriel Rheinberger (PDF). Florida State University College of Music. Retrieved on 2007-06-19. ↑ Glück, Sebastian Matthäus (2003). "Literature-based reed assignment in organ design". PIPORG-L. Retrieved on 2007-06-19. ↑ Galuska, Andrew R. (2001). "Messiaen's organ registration". Moore's School of Music: University of Houston. Retrieved on 2007-06-19. Organ Memes A site dedicated to the humorous struggles of playing the pipe organ. Organlive An online station of classical organ music. Positively Baroque An online station dedicated to organ music of the Baroque period. At the Organ An online station providing weekly programming about the classical organ. Pipedreams A weekly 2-hour public radio program of organ music.